Our markers are available in solid bronze or cast aluminum with a gold color powder coat finish. The powder coat finish involves electrostatically applied powder to the surface which is baked on at 350° for a permanent non-fading weather proof finish. If so desired, the surface of the raised areas can be sanded to high-light the letters or insignias. This process is called facing. All bronze markers are faced. On the back of the markers there are three bosses – two to accommodate a 3/8″ dia. Flag and the third is tapped for the 3/8″ x 20″ brass or aluminum rod. We stock aluminum, aluminum faced and bronze markers for the following wars; Revolutionary, War of 1812, GAR (Civil), Confederate, Vietnam, Spanish American, WWII, Korean, Persian Gulf, WWI, Universal, Mexican, Indian, Franco American, War on Terrorism. 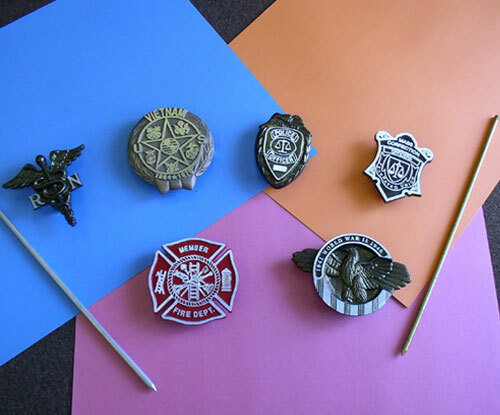 Also occupational markers for Police, Fire, and Medical which can be privatized. We also stock the following military service markers: Army, Navy, Air Force, Coast Guard, Marine Corps, and Merchant Mariner. To request a catalog for these American made products since 1952, click on the request catalog tab.